Kin Kin Creek, situated near Noosa, supports a diverse range of rainforests, wetlands, tree orchards, small crops and grazing lands. It’s a crucial habitat the local community is determined to protect, but Kin Kin Creek is under pressure. In recent years, erosion has become a major problem in Kin Kin. Vegetation has been cleared for housing and agricultural purposes and floods and heavy rainfall have washed away riverbanks, causing mud and land pollution to flow into waterways where it smothers marine habitats, clouds the water and affects water quality. In 2017, Healthy Land and Water teamed up with Noosa and District Landcare Group and Noosa Council to design and implement the Keeping it in Kin Kin project in an effort to prevent further environmental damage. The project aimed to build resilience into the catchment, reduce erosion and minimise the levels of mud flowing into Kin Kin Creek and nearby waterways. After liaising with community groups, Healthy Land and Water’s Data Analysis team utilised the innovative Geographic Information System (GIS) mapping technology to identify and analyse the erosion prone locations within the catchment. Active bank erosion sites along Kin Kin Creek. GIS uses laser technology and the airborne LiDAR sensing method to examine the surface of the land and how it changes over time. The Data Analysis team uses the findings to create precise elevation and canopy height models that are compared to previous surveys to determine an accurate measure of the amount of soil loss from certain areas. The team then compared soil loss data from 2008 to 2015 by creating a monitoring tool known as ‘change analysis’. The data revealed that 2.3 million tonnes of soil had been washed away in the seven years between surveys. The analysis also identified 258 erosion hotspots in the Kin Kin catchment area, including old and current landslips, numerous tracks, gullies and streambanks. Identified erosion hotspots in the Kin Kin catchment area. The results from the assessment were analysed to understand the dominant underlying factors driving potential erosion. 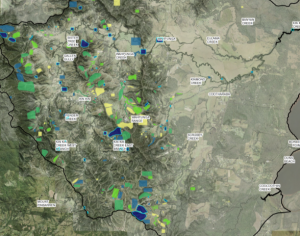 This data was then used to define the sub catchments and prioritise them in order of significance to actively engage landholders to discuss areas of concern. Utilising the data, Healthy Land and Water is collaborating with local conservation groups to design and deliver on-ground restoration work in targeted areas at Kin Kin. In 2018, some of the first major restoration work began on a cattle grazing property Wahpunga Creek. Over 2000 native trees and shrubs were planted, and over 850 metres of fencing was installed to prevent cattle from entering the creek and causing erosion. As the project enters the next phase, Noosa Landcare is currently engaging with landholders within hotspot areas, and continuing on-ground works such as riparian restoration, weed removal, demo sites case studies. A variety of monitoring procedures will be implemented to track the impact of the project as the restoration work is commenced. 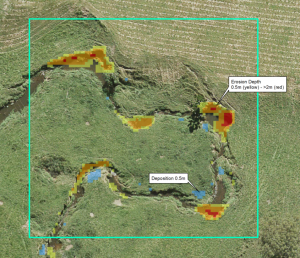 2018: Mapping data is utilised to inform restoration work on a Wahpunga Creek grazing property. 2018: Over 2,000 native trees and shrubs are planted to stabilise the land at the Wahpunga Creek property. 2018: Over 850 meters of fencing is installed to prevent cattle from entering the waterways at the Wahpunga Creek property. Analysis found that the equivalent of 765 Olympic-sized pools filled with soil had been washed away from land around Kin Kin Creek between 2007 and 2015.